Not only is their ability to assess a current outage limited, they also have no way of identifying a problem that may not actually be causing an outage or anticipating where a problem may occur in the future. For example, a failing device could be sparking, creating a dangerous situation that nobody is aware of for days or weeks before it completely fails and causes an outage. “Power distribution system electrical signals include specific failure signatures, which tell a story — for instance whether potential faults and outages are about to occur,” said Dr. B. Don Russell, a power engineer and the Engineering Research Chair Professor and Distinguished Professor in the Department of Electrical and Computer Engineering at Texas A&M. Simply put, they’ve been ‘listening’ to the electric grid for more than a decade to analyze signals and identify which ones indicate a potential problem. Conceptually, it is not much different from an auto mechanic who can hear a problem in an old engine and know exactly what is causing it. Practically, however, this is an entirely new technology. “A practical benefit of using DFA is the ability to detect and repair arcing and misoperating devices that often cause wildfires. In a four-year study just completed at Texas A&M, it has been proven that many fires can be prevented with this technology,” Russell said. The Texas A&M research team led by Russell includes Carl Benner, Jeff Wischkaemper and Karthick Manivannan. Their research, sponsored by the Electric Power Research Institute, developed the DFA technology. It is an autonomous, distributed computing system that provides electric utility operators a continuous situational awareness of the condition of each circuit. The result is increased reliability of their network and reduced outages. It enables the utility operator to predict adverse power line conditions and events generally not detected by conventional technologies. An obvious example of the benefits from this technology is wildfire prevention. High winds can cause electric lines to contact, causing arcing on the line and damaging it, but not causing a complete outage. 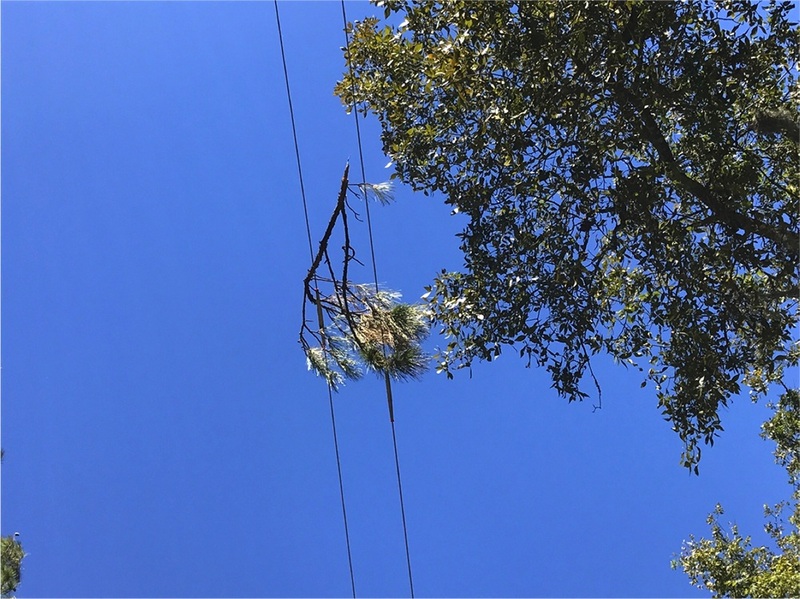 The sparks from these faults have been known to start wildfires, especially during dry conditions and often without the knowledge of utility personnel. Repeated contact can burn the line down. DFA has also helped utilities detect and locate tree branches making contact with power lines and causing faults, which can start fires directly or break a line and cause it to fall to the ground. An example of this situation was the devastating fire of 2011 in Bastrop, Texas, where a true worst-case scenario unfolded when high winds and severe drought conditions caused the most damaging wildfire in Texas history. Many wildfires in the western United States last year were also linked to electric faults. Russell explained that awareness of adverse events and conditions, even before they cause a failure, enables utility companies to take preventive action by performing repairs or condition-based maintenance. The DFA technology is a result of more than 15 years of continuous research collaboration, resulting in the only system of its kind. This technology is not just lab tested, it is field proven as well. Robert Peterson, director of control center and emergency preparedness at Pedernales Electric Cooperative, the nation’s largest distribution electric cooperative, said DFA has been invaluable in providing information that is not available any other way. Dr. Comfort Manyame, senior manager of research and technical strategy, and Robert Taylor, engineering specialist, at Mid-South Synergy were also complimentary of the technology. Taylor said, “It makes me wonder what we did before DFA,” while Manyame said they are hoping to expand their use of DFA in the coming years. Thomas Ellis, manager of engineering at Bluebonnet Electric Cooperative, said that their control center operators have used DFA information to accurately determine the cause and location of multiple faults, including a fault that affected just one single customer on a stretch of circuit with more than 160 miles of overhead line. He added that DFA technology not only improves customer satisfaction, but also improves worker safety, thanks to diagnostic capability of the system leading to more efficient troubleshooting. That kind of industry feedback makes all of the efforts by DFA creators worth it according to Benner, an engineer, co-inventor and associate research professor in the electrical and computer engineering department. This research is funded by the Texas A&M Engineering Experiment Station and the Texas Wildfire Mitigation Project, which was initially established by the Texas State Legislature in 2013, with the support of the Texas A&M Forest Service. This article by Aubrey Bloom originally appeared on the College of Engineering website.